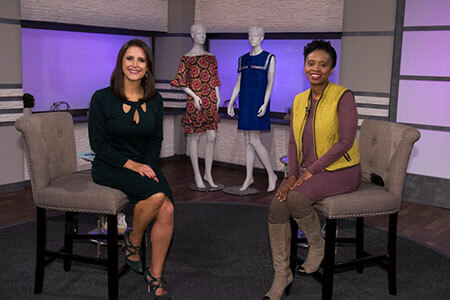 Photo Caption: Phumelele Kunene, Berkeley College student and President/Designer of BlackPhumelele Designs, discusses developing a career in fashion during an appearance on the public television program Life & Living with Joanna Gagis on July 1, 2017. Berkeley College student and President/Designer of BlackPhumelele Designs, Phumelele Kunene, appeared on the public television program Life & Living with Joanna Gagis on July 1, 2017. Born in South Africa and raised in Swaziland, Ms. Kunene reflected on transitioning from a career in banking to the fashion industry after immigrating to the United States. Click here to watch Ms. Kunene’s entire appearance on Life & Living with Joanna Gagis. Ms. Kunene is currently pursuing a BBA in Fashion Merchandising and Management with an International Business minor at Berkeley College, on track to graduate in 2018. She was one of the inaugural designers-in-residence of theBROOKLYNfashionincubator (BFI) at Berkeley College. The incubator, one of five spearheaded by Macy’s in talent-rich areas across the United States, provides its designers access to work space, supplies and advice from leading experts in all facets of the fashion business, including sourcing, production, marketing and e-commerce. BFI recently celebrated its one-year anniversary, welcoming a new group of designers. Click here to learn more about this year’s designers-in-residence. BlackPhumelele Designs will be hosting a pop-up shopping event from July 24 to August 5, 2017, at The Meat Market (380 Tompkins Ave, Brooklyn, NY). Ms. Kunene also has been working on the launch of her organic skincare product line, Ebaata Skincare. Click here to learn more about Ms. Kunene and BlackPhumelele Designs. To watch Phumelele Kunene’s entire appearance on Life & Living with Joanna Gagis, click here.